With this project, I decided to create a situation of a car that goes through a highway, and called it Car A. This car goes through T intersection two times a day, at 9:30 am and 8:30 pm. The driver of car A watched cars go through the intersection, and saw that on average every 3 lights a car would run that red light. I called this car Car B. With this I also created the fact that there are 26 seconds per cycle or 3323 cycles per day. Next I moved onto looking for the average length of a truck, which is 15 feet. I then went through the math and saw that car A arrives at the intersection in the morning at cycle 70, which is not a multiple of 3, so they are safe. At night car A gets to the intersection at cycle 3288, which IS a multiple of 3. Now to get into the math. I gave car B 48 feet and 65 mph, and car A with 12 feet and 20 mph. They will both get through the intersection .6 seconds, meaning there will be a collision, but where? I saw that I could rule out collisions in the back and middle (T-bones) for each car. 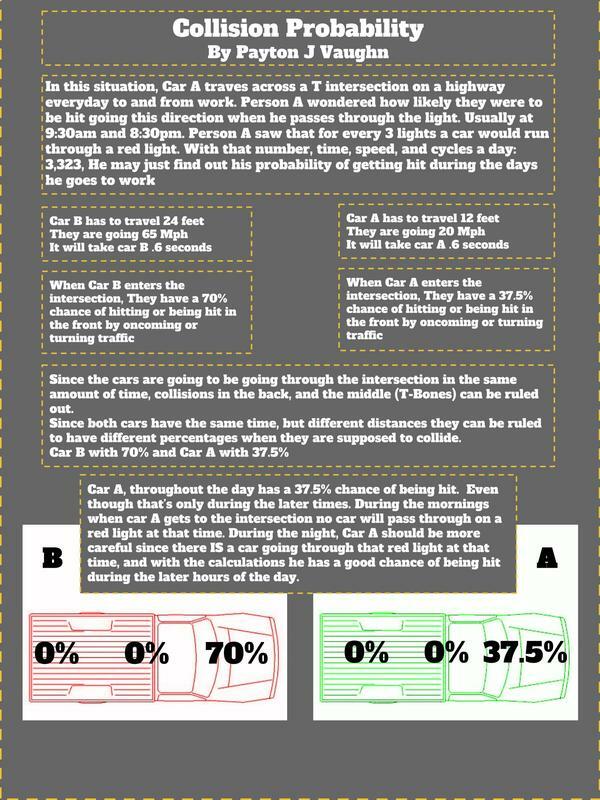 Since both cats have different speed and distances, I took into account of other cars from the straightaways and turns, and factored them in for each car, i came out with 70% for car B, when they enter the intersection they will hit or be hit by another car. with car A, along with the possible other cars running lights they had a 37.5 chance of being hit when they went through the intersection.